Speech and Debate Timekeeper is an open source, multi-platform timer for speech and debate competitions. 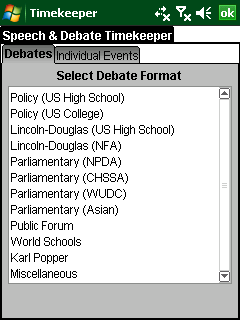 Speech and Debate Timekeeper for WM has speech order and time limits preset for Policy, Lincoln-Douglas, Parliamentary, Public Forum, World Schools, Karl Popper, and miscellaneous debate formats as well as individual events. This timer gives visual and/or vocal time signals at user defined intervals. Timer for speech and debate competitions with spoken and visual time signals. ...... At the end of each speech, cross-examination, or preparation, the timer automatically sets itself to time the next thing that needs timing at the push of a button. No stopwatch or general purpose timer comes this close to fulfilling the role of a dedicated timekeeper in a round. * Simple stopwatch style interface simultaneously shows time elapsed and remaining. *Buttons are large so that they can be finger pressed on touch screen PDAs. * Visual time signals on a color coded background indicating minutes or seconds remaining using a traffic light coloring scheme. * Spoken time signals or tones, including protected minute alerts for points of information in constructive speeches of Parliamentary debates. * Tracks speech order and prep times. Default time limits are set according to the selected event and are adjustable. Read document(PDF/MS/WORD,etc.) and Convert it into WAV formats. Qweas is providing links to Speech and Debate Timekeeper for WM 2.4.1 as a courtesy, and makes no representations regarding Speech and Debate Timekeeper for WM or any other applications or any information related thereto. Any questions, complaints or claims regarding this application Speech and Debate Timekeeper for WM 2.4.1 must be directed to the appropriate software vendor. You may click the publisher link of Speech and Debate Timekeeper for WM on the top of this page to get more details about the vendor.